Recently, a catchy article caught my attention in one of the regular newsletter emails I receive. Lonely Planet’s 10 best places to have a mid-life crisis. First on the list is Badda bling, Dubai, UAE! Below is the complete list. Summer solstice just passed a couple of days ago and though the day will start becoming shorter, the hottest day in Dubai is yet to come. Minhad Airport, an inland military base on the last week of June. During these times, tourists and local families are likely to go for water fun activities like going to the beach and resorts or cruising or shopping at air conditioned malls. With this in mind, Dadabhai Travel has programmed several tours which are likely to be a great activity this summer. Tourists and families can avail of the discounted combo rates and save a lot on their summer outing budget by going for two (2) tours instead of just one (1). Dubai is very famous for its desert safari and modern architecture. The desert safari usually sells from AED 139 up to AED 260 and the Wild Wadi tickets go for AED 205 each. 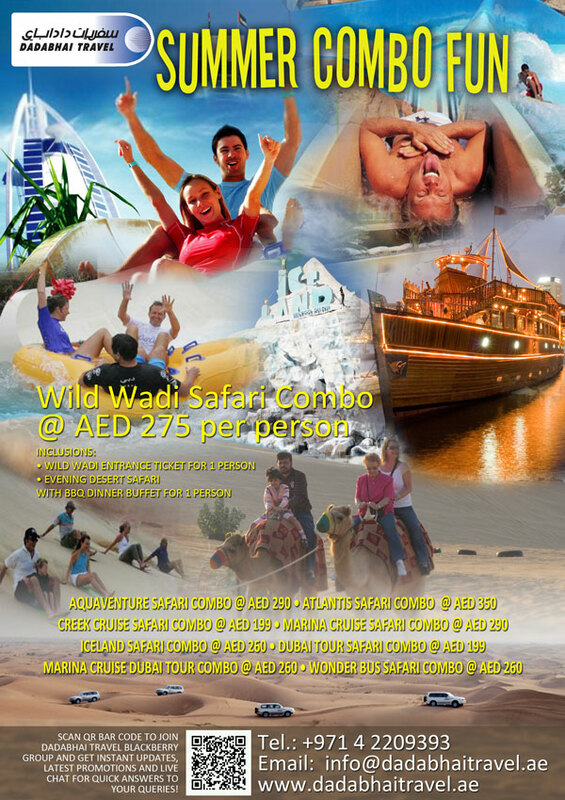 With Dadabhai Travel Wild Wadi Safari Combo, you can have both for only AED 275 per person! You will save from AED 139 per person! Visit www.dadabhaitravel.ae for more details and holiday packages. India has been voted as top future global destination for UAE travellers, as per the Visa Global Travel Intentions Survey 2011. While India gained 27percent votes, the UK followed with 23 percent and Singapore with 20percent as top future global destinations for UAE travellers. The results were announced after surveying nearly 503 UAE residents, as part of a global study by 11,620 respondents from 23 countries around the world. The top destinations visited b UAE travellers during the past two years were India (44percent), followed by Malaysia, UK and Egypt all tied at 14 percent each. With such a diverse cultural constitution in the UAE, India has been a consistently popular tourist destination for people living in the UAE. The reason for India being favourite destination, may be because it is home to large population of expatriate Indians, working in the UAE, and also due to its close proximity and excellent value travel links and exotic reputation, making it a desired location to visit, said Kamran Siddiqui, General Manager, Visa Middle East. The United Kingdom (UK) was also among the top choices for both UAE and global travellers overall, with majority of respondents who wanted to visit the UK claimed that they intended to participate in a sporting event. The forthcoming London2012 Olympic Games could be a major factor for it being a top attraction for travellers, said Ross Jackson, Head of Cross-Border Business, Asia Pacific, Central Europe, Middle East and Africa, Visa. According to the research, travellers from UAE have spent more than US$1801 over the past two years, and these are likely to grow to US$2,367 in next two years, it said. The survey revealed that availability of good deals, natural scenery, political stability, good weather and new locations are some of the major factors that have influenced the choice of destination among global travellers’. The Dubai economy has bounced back strongly from the financial crisis, than was expected, according to the latest official data. The figures from Dubai Statistics Centre revealed that the growth of the economy in the emirate was at the rate of 2.8percent in 2010. The increased pace of growth in 2010, signifies the huge change in its fortune when the effects of the global economic crisis fell in 2009. The economy of the emirate dripped by 2.4percent that year, with the impact of the financial crisis, taking a toll on the Dubai property market too, resulting in cancellation and delay of several projects worth tens of billions of dollars. The latest statistics have revealed that real GDP in Dubai grew to Dh.293.6bn in 2010, an increase from Dh.286.6bn in 2009. Further, according to the prediction by IMF, the entire economy of UAE is likely to grow by 3.5percent this year. The Family Development Foundation (FDF), together with Abu Dhabi Urban Planning Council (UPC), unveiled the Masterplan for a new square adjacent to the Corniche area in Abu Dhabi, called Mother of Nation Square. This is in honour of the efforts and achievements of the Supreme President of FDF and Chairwoman of General Women’s Union, H.H. Sheikha Fatima bint Mubarak. The Square will be built as token of appreciation and recognition of the numerous initiatives by H.H.Sheikh Fatima, in support of issues pertaining to women and family. The project reflects the special place that H.H. Sheikh Fatima has in the hearts of Emiratis. The square will be accessible from all areas, adjacent to the Corniche, linking to the main roads in old Souq area. The Square is designed to be the new landmark which attracts cultural and sporting events. More than 90percent of the mall has been leased in Fujairah City Centre, with the shopping mall all set to be unveiled by early 2012. Owned by Majid Al Futtaim Properties, together with Fujairah Investment Establishment, the mall has crossed several major milestones in construction and safety aspects, and is on schedule for opening, revealed a statement by the developer. Fujairah City Centre will offer the much-required boost to the under-serviced retail sector in Fujairah, with its unique, high-quality shopping and entertainment experience, said Yousif Al Ali, Asset Director. The mall’s leasing, construction and overall progress till date reflects the commitment by Majid Al Futtaim Properties. Nearly 100 per cent of the city centre has been leased out, with 100 out of its total 105 retail outlets confirmed leased out. Spanning across an area of 34,000 square meters, the varied retail mix of the shopping mall will cater to the needs and projected growth of Fujairah community and will include the largest Carrefour hypermarket in the emirate. Apart from having crossed more than one million accident-free work hours, the Fujairah City Centre is now expecting a Gold LEED rating. The Dh.400mn city centre is located at the intersection of new Fujairah-Dubai highway and the current Masafi Highway at the entrance of Fujairah City. Aiming to draw more tourists into Dubai, the RTA has launched re-designed travel packs. Named Terhaal, the packages are available at all metro stations, apart from promotional coupons, vouchers and two silver NoI cards worth Dh.14 each, and a map providing info about Dubai’s public transport modes and Dubai tourist destinations. According to Dr. Aysha Al Busmait, Director – Marketing and Corporate Communication, RTA, the pack is priced at Dh.65, though actually it is worth Dh.1000. The Dubai Travel Pass aims to help the tourist population in Dubai. The RTA wanted to offer tourist with better access to public transport system, and offer them information regarding use of various transportation modes during their stay here. Hence, the content of the pack is quite informational, educational, and targets visitors. The promotional coupons are also open to general public. The choices of coupons are based on an understanding, presuming what tourists do when they come to Dubai. The coupons also offer discounts at water theme park, shopping destinations, fine dining restaurants and adventure sports. Discounts are offered on services such as RTA water taxis, apart from games and activities including ballooning, bowling, travel products, and desert safari. The package is inclusive of major information, including police embassies, emergency telephone numbers and ambulance services. The travel agents will be held responsible for the whereabouts of the visitors entering the country through them. They are also answerable for visa overstays of the visitors, the General Directorate of Residency and Foreigners Affairs of Sharjah announced. The announcement comes at a time when thousands of jobseekers enter the country every year through visit visas, causing administrative issues. The Directorate recently held a meeting with 50 leading travel agents in Sharjah to convey the messaged, and has emphasized on the need to regulate the tourism sector. The decision to tighten the visa regime was considered, as the demand for visas for under-18 increased during the recent past, with many not returning within the allotted time. Nearly 49,583 tourist visas have been issued in 2009, 75,008 in 2010, and 33,473 visas during first four months of this year. The meeting suggested preparation of a standard form for licensing tour operators, and called for detailed explanation of activities of the tourist company, in the license issued by the Department of Economic Development. In Dubai, traffic is now lesser than congested as before. This is because most of the commuters are now using the new 23 km Green Line Metro which opened last Saturday (September 10, 2011) to the public. The Dubai Metro entered the Guinness World Records as the longest automated driver-less Metro in the world with a total length of 75 km. Not only the local residents of Dubai benefit on this new facility but also added attraction to business and tourist. Most of the tourist enjoyed the city more due to lesser travel time specially on the road during peak hours.